People in the group all post at THE EXACT SAME TIME, no matter where they are in the world. And we create a circle. To do that, at the beginning of this post, I provide a link to the blog that comes before me in the "hop". So if you came to me from Johnny Two Brows' site, you're in the right place. John is a tarot reader right here in VA, where I live. And though I've never met him person, we have actual three-dimensional people in common. When you're done reading my post, I'll link you to Chloe's Celtic Lenormand site. Chloe has always been a big supporter of the Daily Draw, so you'll want to be sure to visit her page. So the idea is that all the bloggers create a big circle that you can go around and read each person's views about the chosen topic, which is "What traditions are important to you in how you read Tarot?" Fun huh? I get new readers here, you get new blogs to visit there and everyone wins! Hooray! 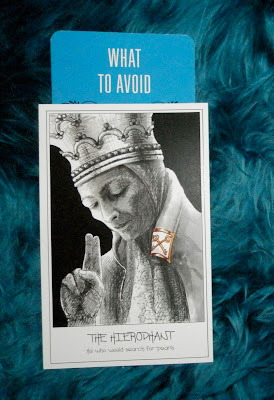 Today's Draw: The Hierophant from the Pen Tarot in the What to Avoid position from the Deck of 1000 Spreads. Would you call yourself a tarot traditionalist? What kinds of things do you do to buck tradition? And what traditions are important to you in how you read the tarot? Usually, I randomly draw a card from a tarot deck and randomly choose from the Deck of 1000 Spreads. But today I intentionally chose two cards to communicate how I feel about tradition (represented by the Hierophant). I don't REALLY think you should avoid it in tarot—or in life, as a matter of fact. In fact, I think we should all know the traditional ways. I think we should know what all the cards mean. I think we should at least be familiar with traditional spreads. And I think we should all know how to give a traditional, face-to-face reading. But that's where I draw the line. One of the classes I teach as a tarot teacher is called Taboo Tarot, Breaking All the Tarot Rules. In that class I'll make you to shuffle your cards a different way. I'll have you to read a querent a different way. I'll compel you to learn something different in the area of spreads. And all of that will not only force you to have fun...haha, but to also learn the most important "rule" of tarot there is—that it works no matter what you do. I can tell you that rule all day, but you won't get the hang of it until you start breaking the rules yourself. And why should you break the rules? Because tarot has so much more to offer than tradition "allows". If you're not familiar with my Deck of 1000 Spreads, it's the perfect example. Traditionally you would use a Celtic Cross as a spread. Or you would find a spread in a book. If you were really adventurous, you might try to create a spread on your own. But the Deck of 1000 Spreads opens even more avenues beyond that. You can "divine" a spread, meaning you can draw spread positions the same way you'd draw tarot cards from a deck, then lay them out in spread form. You can easily re-tool any spread you might find online or in a book. Plus, the colors on the spread cards pull out colors in your tarot cards, adding a whole new dimension to your readings. And that's just a few of the things people are doing for the first time because of this deck. I know that sounded like an ad for my cards. And it was. Kinda...haha. But I write ads for a living, so it can't be avoided. The point is that when you start thinking outside of traditional realms, you can create something that totally changes the game for your readings. Tradition forms the basis, but breaking tradition is what keeps the practice alive in your heart and soul. At least for me it is. And when you bear the excitement of a practice that's always evolving, you light a spark that keeps that keeps the energy going from generation to generation. Look, if we never veered from tradition, we'd all be reading in stuffy parlors with Tarot de Marseilles decks. And some LOVE the idea of that. And that's cool. But I'll bet few people actually still read in the same manner people did in the 15th and 16th centuries. Heck, it was a card game back then. SOMEONE had to buck tradition to even make it a divination system! And that's exactly my point. Everything derives from breaking tradition. When man moved out of caves and into small farming communities, they were breaking tradition. In fact, when primates start to walk upright, THEY were breaking tradition. It's in our DNA, ferchrissakes! So when I teach tarot, I tell my students to memorize their card meanings, but to also read "intuitively". I tell them to learn their Celtic Cross, but also create their own spreads. They learn to read traditional ways, but also with multiple decks, or different kinds of shuffles or ways of drawing the cards. Because that's how you get from a TdM to a Sola Busca to a RWS to a Greenwood, Thoth or non-traditional deck...by knowing what you're talking about and what you're supposed to do—but not being limited by it. I recently taught a spreadcrafting class and told the students that, at some point, I had to give myself permission to stop looking in books for spreads and create my own. Giving myself permission, and assuming the power to off-road based on all those who broke the rules before me, was so freeing! It set my creative juices flowing and gave me new excitement for tarot. And it's what eventually led to creating a new way to approach spreadcrafting with my deck. Tarot needs more of that. Tarot needs legions of free thinkers with the permission to break the rules and thank god there are many out there. But this need is not just tarot's. It's needed in politics, business, religion and society in general. Man and the times are continually evolving and our leaders and iconoclasts need to keep pace. It's vital to know where we came from and why. But when tradition is no longer relevant or "big enough" for the people who follow it, it's time for a change. So now that you know how I feel about tradition, I'm going to tell you that traditionally, you'd visit Chloe's Celtic Lenormand page after mine. In fact, I strongly recommend that, because Chloe rocks. But maybe you want to buck tradition and hop backwards to Johnny Two Brows' site. Or maybe you want to do something entirely different and choose someone from the master list of participating blogs. Whatever you choose, you've got my permission. ;) Have fun! I agree, traditions are made to be broken. But just like English grammar rules, if you break them before you understand them, you risk looking like a moron. Anyway, I'm a big fan of your deck of 1000 spreads. It's really helped me see new possibilities in readings I never would have without it. Legions of free thinkers. AMEN. :D Or, so mote it be. "Heck, it was a card game back then. SOMEONE had to buck tradition to even make it a divination system!" YES! That! Love the shameless marketing! Don't apologize for that! And I am all for breaking the rules...I did a reading and a friend did a rune casting on the same topic at the same time for a client. It was great how it all came together! Cassandra sort of bet me to this with her grammar rules comment, as I was reading over your post, I again realized how much tarot has taught me about creative writing, and writing about tarot. Both creative forms using your intuition to set the course. But a writing rule rings true even in the tarot. "Learn the rules, and then break them." Rules are for guidance, but you'll never truly connect with spirit until you break free and do your own thing. Yes, ma'm. I'm a freelance copywriter. I've been freelance for 17 years and I worked in agencies and in-house for 10 years before that. :) Do you work in an agency? I'm an editor, and I don't hate you. :) The editors you're thinking of don't know how to use ad style, then. Style traditions are just the same as all the other ones, subjective, and constantly being challenged and shifted in various directions. Must be why there are at least three main editing style guides instead of one, and that's just in the USA. I personally find your balance of humor, conviction, and salesmanship quite appealing. And, like some of the others here, I find your 1000 spreads idea to be stellar. Got it on my wish list. I'm an editor-in-training, and am a stickler for some rules! When it comes to reading the Tarot, though, I'm with the 'rule-breakers' :-) Love your post; thanks for sharing. "Everything derives from breaking tradition...." I think I need to inscribe this over the door of my altar room or something...needs to be remembered. Well DONE!